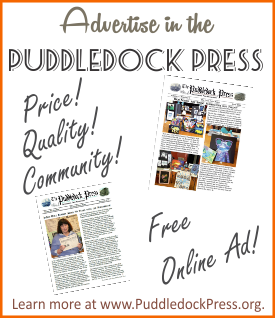 You can enjoy the Puddledock Press without leaving your home, or searching the web to find it. We have two low cost ways to make receipt of the Puddledock Press more convenient for you. Naturally, your subscription to the Puddledock Press helps defray the cost of printing the paper and mailing the Puddledock Press copies directly to you. 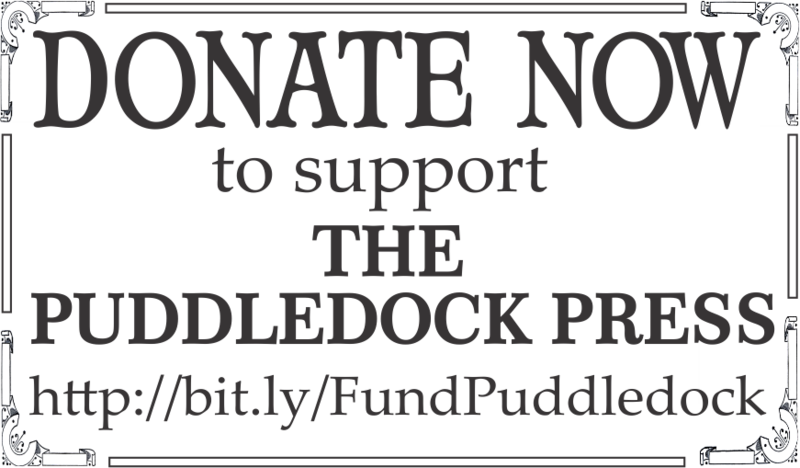 For a conveniently low subscription rate, of $5.00 per year, you can have the latest issue of the Puddledock Press emailed directly to the email address of your choice. Email subscribers will get their copies of the Puddledock Press in color. Be sure to include your email address with your request. Make sure the email address is clearly spelled out, and include a phone number so we can contact you in case we have difficulty sending your issues. For those who prefer hard copies of the paper, but want the convenience of home delivery, you can subscribe to our mail delivery service for the low subscription rate, of $20.00 per year. Mailed copies will be the printed black and white issue. Be sure to include your home address with your request. Make sure the street address is clearly spelled out, and include a phone number so we can contact you in case we have difficulty sending your issues. For those who prefer to have their hard copies in color, but do not want to print it our themselves, We have a special subscription rate for color copies. 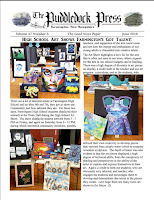 For a subscription fee of $50.00, you can get a printed color version mailed to you. 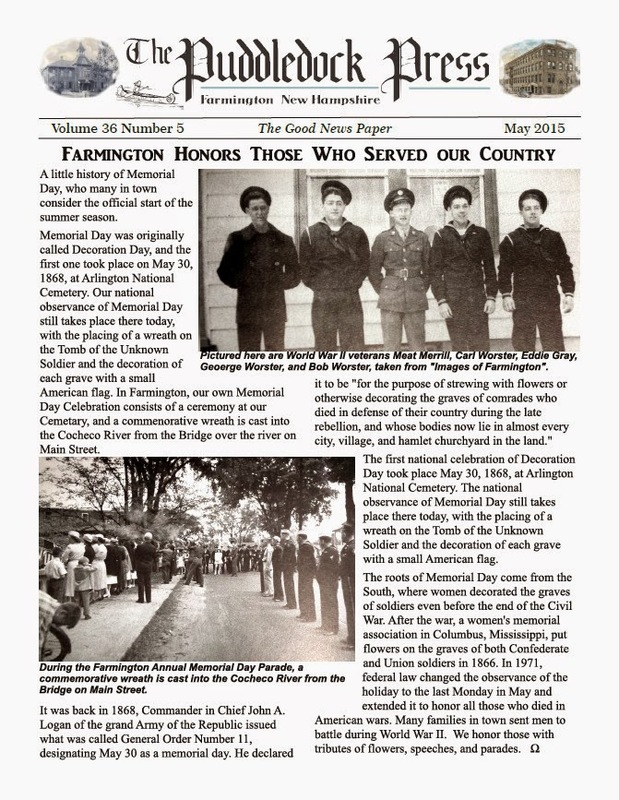 You can find free copies of the Puddledock Press both online and at our local Farmington distribution sites. 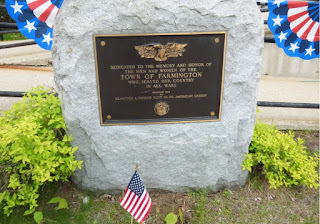 Check the "Find a Puddledock" page for the name and location of our supporting Farmington distribution sites. 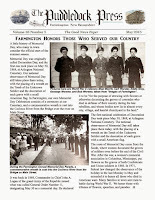 You can also find digital copies of the paper online at our website at www.PuddledockPress.org, and both current and back issues are also featured on the Farmington Historical Society's Puddledock Press tab at www.FarmingtonNHHistory.org. You can also find us on Facebook and Twitter, if you use those social media tools.